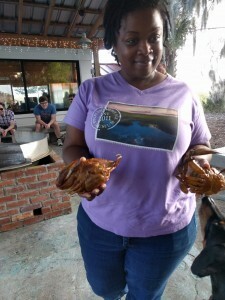 Over the holidays I visited family in Savannah, GA. While there I had the opportunity to visit the Pin Point Heritage Museum. Pin Point is a self sustained community founded by first generation freedmen, the Gullah/Geechee. It is located on Moon River in Savannah and it’s main employer (through the 1980s!) was A.R. Varn & Son oyster and crab factory. 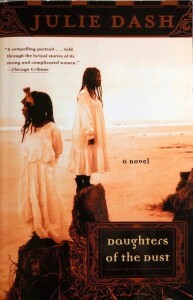 While visiting the museum, I picked up Daughters of The Dust by Julie Dash, [LAPL | Indiebound] a historical fiction novel that intertwines stories of the Gullah/Geechee with the protagonist Amelia’s anthropological research and family history. I’m enjoying the descriptions of the landscape since GA has a distinct climate and geography. The characters and struggles are relatable and the family relationships and friendships feel contemporary. While the museum’s focus was on the oyster & crab factory as benevolent employer, aside from men being fisherman, there has been no mention of the crab factory in the book so far. I’m glad I had the opportunity for further reading (even fiction!) to see another dimension to this part of American culture that I know very little about.